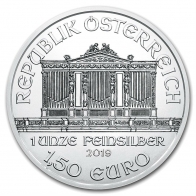 The Austrian Mint is responsible for releasing the Austrian Philharmonic coin series, which is available in gold, silver and platinum. 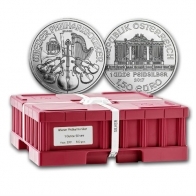 Silver Austrian Philharmonic coins are available in current year and backyear issue, and individually, in tubes of 20 or in monster boxes of 500 coins. 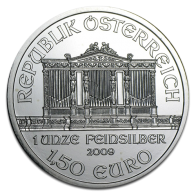 All silver Philharmonics are denominated in Euros. 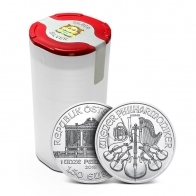 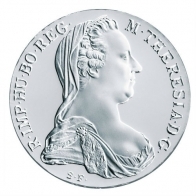 Clients of SwissBullion.ch may purchase silver philharmonics with EUR, USD, CHF or GBP or with Cryptocurrencies including Bitcoin. 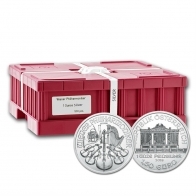 Coins may be purchased for VAT-exempt Swiss storage or for delivery worldwide.